Amanita Design forum > Botanicula > Botanicula on Mac (Moderator: Lamkin) > Mac OSX version?? I got the download version for Mac via the HB. It didn't specify a required version of OSX before downloading; looking around, on the site Macgamestore, for example, it says 10.5 or later. I have 10.5.8 on a MacBook Pro. It installed fine, but when I launch it, it says: "You cannot open the application "Botanicula" with this version of MacOSX". Well that's not where that information should be, hidden away. So what happens to my purchased game - it stays useless for me? That's not fair, is it? The bundle's main page has a hyperlink to that page listing system requirements. looking around, on the site Macgamestore, for example, it says 10.5 or later. I'm running Lion (10.7.2) so shouldn't be having a problem, but the program won't launch. It just gives me the "this program has closed unexpectedly" notice. Any suggestions? I love Machinarium and was hoping for a great experience with Botanicula. I'm totally irritated that I can't even see the opening screen! And I'm assuming you've tried reinstalling the game? Well, you could always e-mail the developers (support at amanitadesign dot com) with a crash log and your system specs, etc. I hope it gets worked out. Come back to post and let us know what happened. If you find that Botanicula is crashing on your Mac with Lion 10.7.2, please update to OS 10.7.3. it should help. thanks! being a big fan since Samorost I immediate invested 20EUR via HumbleBundle for BOTANICULA and the beautiful extras. But then my heart broke: MacOSC 10.6 only? Don't you have a heart for persons who use their machines for more than a year? My dear Mac is running stable for years with 10.4.11 and now this stops me from playing BOTANICULA. I don't regret having invested the money into your work, but I deeply regret not being able to play it without investing in a higher MacOSX version. 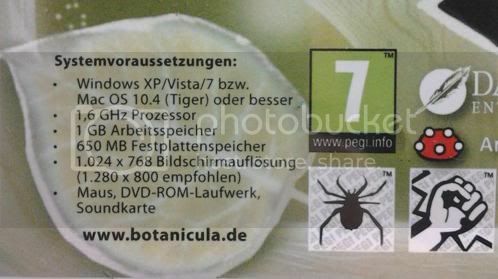 I just bought the BOTANICULA DVD via Amazon and it doesn´t run on Mac OS 10.5.6 - while the (german) package says: minimum requirements for mac -> 10.4 Tiger!! So I just bought your beautiful game and can´t play it. So sad!! And I won´t update my system for another 29€ just to make it possibly run - i read about people having 10.7 who don´t get the game to run. Will there be soon a patch or bugfix to solve this? Otherwise I just have to send the game back, since its of no use to me in this condition. Snow Leopard (10.6) is the minimum needed to play the game on OS X. And though I'm just a fan and not one of the developers, I don't believe there will be any forthcoming patch or fix which would enable the game to work on Macs running anything earlier than Snow Leopard. thanks for the info - at least I know that it definetely won´t work and I don´t waste any more time trying to find a way to make it run. its really sad, though. I mean - developers - it even runs on freakin´ 12 year old WinXP!... Is it really that a big deal to make it compatible to a MacOS that´s only three years behind? I have bought Botanicula on DVD. I can't make it run on a Macbook Pro 2.3 GHz with OSX 10.7.5.